Edward V (2 November 1470 – c. 1483) succeeded his father, Edward IV, as King of England and Lord of Ireland upon the latter's death on 9 April 1483. He was never crowned, and his brief reign was dominated by the influence of his uncle and Lord Protector, the Duke of Gloucester, who deposed him to reign as Richard III on 26 June 1483; this was confirmed by the Act entitled Titulus Regius, which denounced any further claims through his father's heirs. Edward and his younger brother Richard of Shrewsbury, Duke of York, were the Princes in the Tower who disappeared after being sent to heavily guarded royal lodgings in the Tower of London. Responsibility for their deaths is widely attributed to Richard III, but the lack of any solid evidence and conflicting contemporary accounts also suggest other possible suspects. Edward was born on 2 November 1470 in Cheyneygates, the medieval house of the Abbot of Westminster. His mother, Elizabeth Woodville, had sought sanctuary there from Lancastrians who had deposed his father, the Yorkist king Edward IV, during the course of the Wars of the Roses. Edward was created Prince of Wales in June 1471, following Edward IV's restoration to the throne, and in 1473 was established at Ludlow Castle on the Welsh Marches as nominal president of a newly created Council of Wales and the Marches. In 1479, his father conferred the earldom of Pembroke on him; it became merged into the crown on his succession. Prince Edward was placed under the supervision of the queen's brother Anthony, Earl Rivers, a noted scholar, and in a letter to Rivers, Edward IV set down precise conditions for the upbringing of his son and the management of his household. The prince was to "arise every morning at a convenient hour, according to his age". His day would begin with matins and then Mass, which he was to receive uninterrupted. After breakfast, the business of educating the prince began with "virtuous learning". Dinner was served from ten in the morning, and then the prince was to be read "noble stories ... of virtue, honour, cunning, wisdom, and of deeds of worship" but "of nothing that should move or stir him to vice". Perhaps aware of his own vices, the king was keen to safeguard his son's morals, and instructed Rivers to ensure that no one in the prince's household was a habitual "swearer, brawler, backbiter, common hazarder, adulterer, [or user of] words of ribaldry". After further study, in the afternoon the prince was to engage in sporting activities suitable for his class, before evensong. Supper was served from four, and curtains were to be drawn at eight. Following this, the prince's attendants were to "enforce themselves to make him merry and joyous towards his bed". They would then watch over him as he slept. In word and deed he gave so many proofs of his liberal education, of polite nay rather scholarly, attainments far beyond his age; ... his special knowledge of literature ... enabled him to discourse elegantly, to understand fully, and to declaim most excellently from any work whether in verse or prose that came into his hands, unless it were from the more abstruse authors. He had such dignity in his whole person, and in his face such charm, that however much they might gaze, he never wearied the eyes of beholders. As with several of his other children, Edward IV planned a prestigious European marriage for his eldest son, and in 1480 concluded an alliance with the Duke of Brittany, Francis II, whereby Prince Edward was betrothed to the duke's four-year-old heir, Anne. The two were to be married upon their majority, and the devolution of Brittany would have been given to the second child to be born, the first becoming Prince of Wales. Those plans disappeared together with Edward V.
It was at Ludlow that the 12-year-old prince received news, on Monday 14 April 1483, of his father's sudden death five days before. Edward IV's will, which has not survived, nominated his trusted brother Richard, Duke of Gloucester, as Protector during the minority of his son. Both the new king and his party from the west, and Richard from the north, set out for London, converging in Stony Stratford, Buckinghamshire. On the night of 29 April Richard met and dined with Earl Rivers and Edward's half-brother, Richard Grey, but the following morning Rivers and Grey, along with the king's chamberlain, Thomas Vaughan, were arrested and sent north. They were all subsequently executed. Dominic Mancini, an Italian who visited England in the 1480s, reports that Edward protested, but the remainder of his entourage was dismissed and Richard escorted him to London. On 19 May 1483, the new king took up residence in the Tower of London, where, on 16 June, he was joined by his younger brother Richard, Duke of York. The council had originally hoped for an immediate coronation to avoid the need for a protectorate. This had previously happened with Richard II, who had become king at the age of ten. Another precedent was Henry VI whose protectorate (which started when he inherited the crown aged 9 months) had ended with his coronation aged seven. Richard, however, repeatedly postponed the coronation. On 22 June, Ralph Shaa preached a sermon declaring that Edward IV had already been contracted to marry Lady Eleanor Butler when he married Elizabeth Woodville, thereby rendering his marriage to Elizabeth invalid and their children together illegitimate. The children of Richard's older brother George, Duke of Clarence, were barred from the throne by their father's attainder, and therefore, on 25 June, an assembly of Lords and Commons declared Richard to be the legitimate king (this was later confirmed by the act of parliament Titulus Regius). The following day he acceded to the throne as King Richard III. King Edward V and the Duke of York in the Tower of London by Paul Delaroche. The theme of innocent children awaiting an uncertain fate was a popular one amongst 19th-century painters. Louvre, Paris. Dominic Mancini recorded that after Richard III seized the throne, Edward and his younger brother Richard were taken into the "inner apartments of the Tower" and then were seen less and less until the end of the summer of 1483, when they disappeared from public view altogether. During this period Mancini records that Edward was regularly visited by a doctor, who reported that Edward, "like a victim prepared for sacrifice, sought remission of his sins by daily confession and penance, because he believed that death was facing him." The Latin reference to Argentinus medicus had previously been translated to mean "a Strasbourg doctor", because in Roman times Strasbourg was called Argentoratum; however, D.E. Rhodes suggests it may actually refer to "Doctor Argentine", whom Rhodes identifies as John Argentine, an English physician who would later serve as provost of King's College, Cambridge, and as doctor to Arthur, Prince of Wales, eldest son of King Henry VII of England (Henry Tudor). Edward and his brother Richard's fate after their disappearance remains unknown, but the most widely accepted theory is that they were murdered on the orders of their uncle, King Richard.Thomas More wrote that the princes were smothered to death with their pillows, and his account forms the basis of William Shakespeare's play Richard III, in which Tyrrell murders the princes on Richard's orders. Subsequent re-evaluations of Richard III have questioned his guilt, beginning with William Cornwallis early in the 17th century. In the period before the boys' disappearance, Edward was regularly being visited by a doctor; historian David Baldwin extrapolates that contemporaries may have believed Edward had died of an illness (or as the result of attempts to cure him). In the absence of hard evidence a number of other theories have been put forward, of which the most widely discussed are that they were murdered on the orders of the Duke of Buckingham or by Henry Tudor. However, Pollard points out that these theories are less plausible than the straightforward one that they were murdered by their uncle who in any case controlled access to them and was therefore regarded as responsible for their welfare. An alternative theory is that Perkin Warbeck, who claimed to be a pretender to the throne, was indeed Richard of Shrewsbury, Duke of York as he claimed, having escaped to Flanders after his uncle's defeat at Bosworth to be raised with an aunt. Bones belonging to two children were discovered in 1674 by workmen rebuilding a stairway in the Tower. On the orders of King Charles II, these were subsequently placed in Westminster Abbey, in an urn bearing the names of Edward and Richard. The bones were reexamined in 1933, at which time it was discovered the skeletons were incomplete and had been interred with animal bones. It has never been proven that the bones belonged to the princes, and it is possible that they were buried before the reconstruction of that part of the Tower of London. Permission for a subsequent examination has been refused. In 1789, workmen carrying out repairs in St George's Chapel, Windsor, rediscovered and accidentally broke into the vault of Edward IV and Elizabeth Woodville. Adjoining this was another vault, which was found to contain the coffins of two children. This tomb was inscribed with the names of two of Edward IV's children: George, 1st Duke of Bedford, who had died at the age of 2; and Mary of York, who had died at the age of 14. Both had died before the King. However, the remains of these two children were later found elsewhere in the chapel, leaving the occupants of the children's coffins within the tomb unknown. In 1486 Edward IV's daughter Elizabeth, sister of Edward V, married Henry VII, thereby uniting the Houses of York and Lancaster. 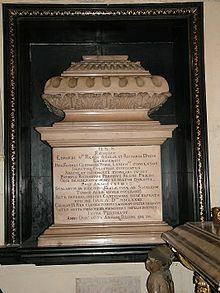 As outlined above, on the orders of Charles II, the presumed bones of Edward V (and his brother) were interred in Westminster Abbey; he was thus buried in the place of his birth. The white marble sarcophagus was designed by Sir Christopher Wren and made by Joshua Marshall. The sarcophagus can be found in the north aisle of the Henry VII Chapel, near Elizabeth I's tomb. Here lie the relics of Edward V, King of England, and Richard, Duke of York. These brothers being confined in the Tower of London, and there stifled with pillows, were privately and meanly buried, by the order of their perfidious uncle Richard the Usurper; their bones, long enquired after and wished for, after 191 years in the rubbish of the stairs (those lately leading to the Chapel of the White Tower) were on the 17th day of July AD 1674 by undoubted proofs discovered, being buried deep in that place. Charles II, a most compassionate king, pitying their severe fate, ordered these unhappy princes to be laid amongst the monuments of their predecessors, AD 1678, in the 30th year of his reign. Kathleen Yorke in the 1911 silent short dramatising a part of the play. Howard Stuart in the 1912 silent adaptation. Paul Huson in the 1955 film version, alongside Laurence Olivier as Richard. Hugh Janes in the 1960 BBC series An Age of Kings, which contained all the history plays from Richard II to Richard III. Nicolaus Haenel in the 1964 West German TV version König Richard III. Dorian Ford in the 1983 BBC Shakespeare version. Spike Hood provided his voice in the 1994 BBC series Shakespeare: The Animated Tales. Marco Williamson in the 1995 film version, alongside Ian McKellen as Richard. Jon Plummer in the 2005 modernised TV version set on a Brighton housing estate. Germaine De Leon in the 2007 modern-day adaptation. Edward Bracey in the 2014 drama documentary Richard III: The Princes in the Tower. Caspar Morley played Edward in the BBC's 2016 adaptation of Shakespeare's Richard III alongside Benedict Cumberbatch as Richard. It is the final episode in the second season of The Hollow Crown. 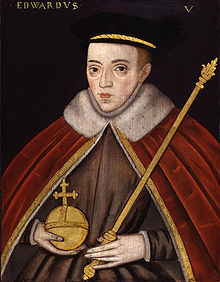 Edward V is also featured as a mute role in another of Shakespeare's plays, Henry VI, Part 3, where he appears as a newborn baby in the final scene. His father Edward IV addresses his own brothers thus: "Clarence, and Gloster, love my lovely queen, And kiss your princely nephew, brothers both." Gloster, the future Richard III, is at the close of this play already encompassing his nephew's demise, as he mutters in an aside, "To say the truth, so Judas kiss'd his master, And cried – All hail! when as he meant – all harm." ^ R. F. Walker, "Princes in the Tower", in S. H. Steinberg et al, A New Dictionary of British History, St. Martin's Press, New York, 1963, p.286. Chisholm, Hugh, ed. (1911). "Pembroke, Earls of" . Encyclopædia Britannica. 21 (11th ed.). Cambridge University Press. p. 79. ^ Letter from Edward IV to Earl Rivers and the Bishop of Rochester (1473), in Readings in English Social History (Cambridge University Press, 1921), pp. 205–8. ^ Dominic Mancini, The Usurpation of Richard III (1483), in A. R. Myers (ed. ), English Historical Documents 1327–1485 (Routledge, 1996), pp. 330–3. ^ 'Parishes : Stony Stratford', Victoria History of the Counties of England, A History of the County of Buckingham: Volume 4 (1927), pp. 476–482. URL: Date Retrieved 16 January 2012. ^ "History of Croyland Abbey, Third Continuation". R3.org. Archived from the original on 28 July 2012. Retrieved 17 August 2012. ^ a b Rhodes, D.E. (April 1962). "The Princes in the Tower and Their Doctor". The English Historical Review. Oxford University Press. 77 (303): 304–306. doi:10.1093/ehr/lxxvii.ccciii.304. ^ a b Pollard, A.J. (1991). Richard III and the Princes in the Tower. Alan Sutton Publishing. ISBN 0862996600. ^ Kendall, P.M., Richard III, Aylesbury 1972, p.427; in the Encomium of Richard III, dedicated to Sir John Donne. ^ Pollard, A. J. (1991). Richard III and the Princes in the Tower. Stroud: Alan Sutton. pp. 124, 132. ^ Pollard, A. J. (1991). Richard III and the Princes in the Tower. Stroud: Alan Sutton. p. 137. ^ 1..Chapter Records XXIII to XXVI, The Chapter Library, St. George's Chapel, Windsor (Permission required) 2..William St. John Hope: "Windsor Castle: An Architectural History", pages 418–419. (1913). 3..Vetusta Monumenta, Volume III, page 4 (1789). ^ Henry VI, Part 3, Act 5, Scene VII, Lines 26-27, 33-34. Ashley, Mike (2002). British Kings & Queens. Carroll & Graf. pp. 217–9. ISBN 0-7867-1104-3. Kendall, Paul Murray (1955). Richard III. W. W. Norton & Co. ISBN 0-393-00785-5. 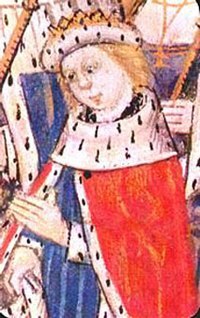 Wikimedia Commons has media related to Edward V of England. Born: 2 November 1470 Died: 1483?